A year ago I chose a word/theme for the new year. My word for 2013 was focus. Choosing focus as my theme for the year helped me to concentrate on small personal goals such as developing my writing, building a capsule wardrobe and finding new ways to relax. It also led me to question a bigger, unresolved problem in my life. A year ago I wrote, “ However, I still have a busy life and often feel overwhelmed by it... I feel I need to work smarter in my job and develop more routine and structure in my domestic life." Looking back, I can see that twelve months ago I was dissatisfied with my work-life balance. My job although part-time (three days) was all consuming and demanded many more hours than I was paid for. Focusing on trying to work smarter at work and be more organised domestically worked to address this to some extent. But I began to find that the escalating pressures of my job meant that I was finding it harder and harder to switch off from work pressures and my hours working at home were beginning to creep up. During 2013 I came to realise that I would never gain the work-life balance I craved whilst I remained in this job. So, a few months ago I made the decision to leave my permanent job. A risk and a jump into the unknown – I know – but also a fantastic opportunity to change direction after twenty-two years in the same profession. The decision was not taken lightly and not without careful financial planning. Realising my permanent job was making me unhappy and deciding to leave it to pursue new direction is one more step in my journey to building a simpler and more meaningful life - a life that I want to live now, a life built upon my dreams and values, a life that has balance. It has been a frightening realisation but also an exciting one. 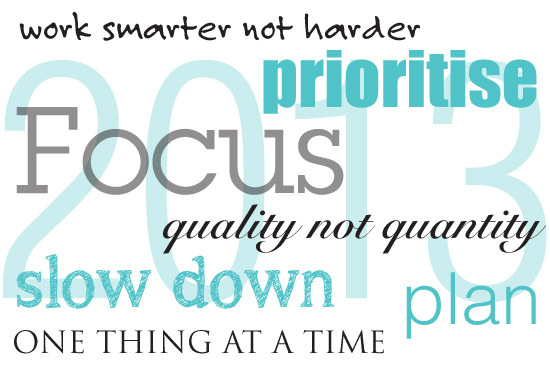 Choosing focus as my word for the year has helped me to see a long-term problem crystal clear. I wouldn't have dreamt a year ago that I had this courage, risk-taking mindset and openness to change or the ability to let go of the past. A year ago I had these dreams but they were lost in the whirlpool of busyness, the tide of expectations and the ripples of my self-doubt. 2013, the year I found focus. Did you have a word/theme for 2013? How did you do? Wow, a really brave decision. Good for your. Best wishes for the future whatever that might hold. A powerful and thought provoking post. Thank you for sharing this and good luck. Well done for seeing things for how they are and taking steps to make your life happier. Focus was the word I considered for 2013, but in the end I didn't choose one. I still think it's something I need to keep in the forefront of my mind though. Wishing you much happiness and success for 2014. Gosh Claire, well done for having the courage to make such a life-changing decision. My husband made the decision to go part-time and he has never been happier. I am also taking steps to give myself the option of leaving my permanent job if it becomes too stressful. It's great to hear from someone who has taken that step and has no regrets. Claire that is a truly wonderful yearly report and I'm very happy to hear that you have found the focus to be so rewarding. My year has been successful also as I took on too many activities in my retirement and I have now de-cluttered some of them that were not so rewarding. Wishing you an even more wonderful New Year - and I'm looking forward to learning what you have chosen as your word for 2014. I love this post Claire! It gave me a lot to think. Perhaps I set a theme for next year as well. Thanks! I admire you for your courage and decision. I didn't have a word for 2013... I had few "resolutions" and I have been able to achieve a couple of them. I wish you a fabulous 2014. I am having a small reflection on what went well and what didn't in 2013. I hope to build on the bad things and change them to good. Our motto for next year is "be more with less". We will extend the house so my FIL can come and live with us. This will mean even deeper cuts to the "things". I am also hoping to us the square foot garden technique to get more out of the garden. Wishing you immense success in the new year. But, like you, this past year has seen me stuck in a 'busyness' rut - not finishing things, not being 'in the moment'. I have lots of things I'd like to achieve and am looking forward to 2014. You always seem a few steps ahead of us! We will be making major changes in our life next year. We have discussed me giving up my job but at the moment it feels too large a jump to take! Have you given up your job already? I will look forward to reading about your experience! I have found working part-time for 23 years that I too have ended up doing more work than paid! Yes I finished my job just before Christmas - eek!